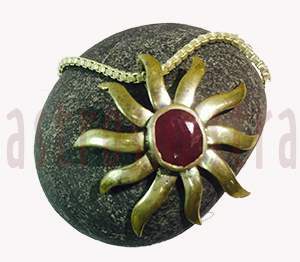 Ruby Gemstone is a birthstone used to enhance the powers of Plant Sun. An individual whose Sun is well placed in the birth Chart can never be unsuccessful. It can be of varying shades of reds to pink. It is the stone of Purplish Pinksh Red color. It is hot and emits hot red rays. In Sanskrit, it is called by the name Manikya. In Urdu and Persian it is called Yakoot. All natural rubies have imperfections in them, including color impurities and inclusions of rutile needles known as "silk". These needle inclusions found in natural rubies distinguish them from synthetics, simulants, or substitutes. Sun rules Heart , brain and eyes in our body , it also indicates our relation with Govt. office/officers as per Vedic Astrology. Wearing ruby birthstone has wonderful effect on any problem regarding heart, bone, brain, eyes etc or in problems relating to Govt /Office. It is symbolic of excellent health, vigor, love and passion. 1. It strengthen our Heart Chakra and keeps the body fit. 2. It is a Lucky stone , bring good fortune to its wearer. 3. It is associated with royalty & the power or life and death. 4. It confers on the individual the highest position, if sought. 6. Wearer is never haunted by any fear of poison. 7. The mental thinking becomes easy going and person starts enjoying sound sleep as well. 8. It increases the self confidence and improves Public Speaking. 9. It helps in protection from psychic or Tantrik attacks. Who should wear Ruby Birthstone ? a) It will give its best results to the persons who are engaged in various professions like engineers, doctors, ministers, politicians, jeweller, judges or persons involved in textiles or electronic goods etc. b) If in the birth chart Sun is Lord of an auspicious house (1, 5, 9 or 10th) as in the case of Aries, Leo, Scorpio or Sagittarius Lagna or is a friend of Lagna Lord and placed in own or in exaltation sign as can be in case of Cancer or Pisces Lagna, it will be useful for the native to wear	it. c) People with Leo Lagna and people born in the month of July or have exalted Sun in their horoscope shall wear it mounted on a Gold ring and around their neck to enhance the power of Sun in their Chart. d) It should also be worn if an auspicious Sun is afflicted or not well placed in the birth chart (Like in conjunction with Rahu or Ketu). e) We should avoid its wearing if Sun is lord of a Trika house or majority of natural benefic are combust, afflicted or are in opposition to Sun. f) Sun is a powerful Karaka of ruling power, high posts, father, soul and profession etc. Therefore those holding or aspiring to hold high political and beurocratic posts; owners, managers or directors of big business, official or businessman connected with power & energy power, weapons, science & Technology, timber & wool, medicine, chemical goods and natives in ancestral business should wear it. For Aries ascendant People, Sun becomes the lord of 5th house which is a Trikona and Sun is a friend of Ascendant lord Mars as well. It is auspicious for this ascendant except if placed in 8th or 12 house. Since 5th house represents intellect and progeny, hence, it will give the native of Aries ascendant higher intellect, ability to gain higher knowledge, pleasure from children and satisfaction from them. It will also give native support from governmental authorities and superiors in his profession. This will give very good benefits during the Sun period for such a native. For Taurus , Sun is the lord of 4th house but Sun is an enemy of the ascendant lord Venus. Such natives should only wear it during Sun Dasa and should not wear it during other periods as it can give ill effects. Sun favourably placed for Taurus ascendant can be helped by wearing it, to give the native gains of property and vehicles, mental peace and good family life as well. For Gemini , Sun is the lord of 3rd house. This is a Dusthana and such natives should not wear it without prior recommendation by an Astrologer, as it will prove harmful for the native. For Cancer , Sun is the lord of 2nd house which is house of funds. Sun is also a friend of Moon the ascendant lord. Hence, to remove face financial problems, they should wear it. If they face eye problems, then also they can wear it. Since Sun is lord of marak house here, hence it is advisable to wear it along with white Pearl for these natives. For Leo , Sun is lord of the ascendant. it is birthstone and is very beneficial. They can wear a it for life. It will protect the person against illnesses and enemies of all types. Since Leo natives can be emotional, It helps them in maintaining mental and nerve control and also increases the self-confidence. For Gemini , since Sun is the lord of 12th house, they should never wear it, as it will be extremely harmful for them. For Libra , Sun is the lord of 11th house of gains. But Sun is also an enemy of Venus, the ascendant lord. Thus, it is advisable for these natives to wear it only during the Dasa of Sun to get gains. Otherwise, these natives should avoid wearing it. For Scorpio , Sun is the lord of 10th house of profession and career. This is a Kendra house also and Sun can prove Rajyoga Karaka for these natives. Sun is also friend of Lagna lord Mars here. These natives can wear it and will get promotions in career, access to superior authorities, name and fame and such beneficial effects in profession. It can help these natives to the extreme in Sun mahadasa. For Sagittarius , Sun becomes the lord of 9th house which is a Trikona and again it can be yogakaraka. Here also Sun is friend of the lagna lord Jupiter. Hence, if worn by the, will bring good opportunities in life for the native. Wearing it can help the father of the native as well. The effects will be pronounced in the mahadasa of Sun. For Capricorn, Sun is lord of the 8th house of death. Sun is also enemy of Lagna lord Saturn. Hence, these Capricorn ascendant natives should never wear it, as it will give them death like sufferings. In such case Sun is the lord of 7th house of marriage and partnerships. Here Sun acquires marak propensity and it is enemy of Lagna lord Saturn. Such natives should never wearit, as it will give them sufferings. Here Sun is lord of 6th house which is a Dusthana. But Sun here is friend of Lagna lord Jupiter. These natives should not wear it as a general rule. But one exception is there. If Sun here is placed in 6th house itself in birth chart, then during Sun dasa it will give extreme beneficial effects, as it will enhance the effects of own house placement. It should not be worn with Blue sapphire and Gomed . It can be worn with Pearl, Yellow Sapphire and Emerald. Diamond and Cat's eye should also be avoided with it. It should be at least three carats (600 mg) in weight and should not have the inauspicious flaws . It should be got set in ring or pendent of gold or preferably in gold mixed with copper in third (Ring) finger. It should be in the first hour/ hora of Sunday, after Sunrise or at mid-day when Sun is Digbali in the bright half of Lunar month after due energizing process (to be discussed later). It can also be worn during Sun's hora on Monday, Tuesday or Thursday. The substitute should at least be six carats in weight. Hardness - 9 with a crystal structure of Trigonal. The finest rubies are found in Burma. 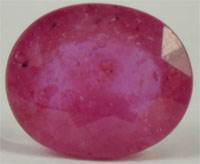 Thailand, Afghanistan, Africa, Vietnam and Pakistan also produce bright rubies. India, USA, Australia and Norway also produce rubies, which are dark to opaque at times. The semi precious substitute are Red Garnet, Sun Stone, red spinal, red Tourmaline etc..
2. It is capable of healing diseases arising out of cold i.e. cough and cold, bronchitis, asthma, mumps and fevers. 3. The Sun also signifies bones and eyes, therefore is helpful in controlling problems related to these. 4. It controls and minimizes the attacks of colic or peptic ulcers, back pains, head injuries and fire accidents. 5. It strengthens heart, blood circulation, and makes one bold & courageous and eliminates depression, sadness and sensuality. 6. It decreases inflammation, bleeding and very helpful in infectious diseases, typhoid, bubonic plague, leukaemia, sickle cell anaemia, schizophrenia, diabetes. 7. It restores the balance of nerves, liver, spleen, heart, thymus, spinal column, adrenals, and cholesterol.